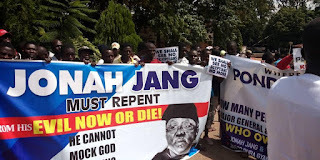 Commercial activities in Jos, the Plateau State capital was temporarily halt as residents of the state stormed the streets to protest the endless killings in the state. The protesters, under the aegis of ‘The Faithfu, a group of clergymen, also want owner of the deadly mining pond in Dura Du, where the car belonging to the missing General Idris Alkali (rtd) was found arrested and prosecuted. They were, however, intercepted by a team of Mobile Police men on their way to the palace of Gbong Gwom of Jos for security reasons. Convener of the protest, Bro. 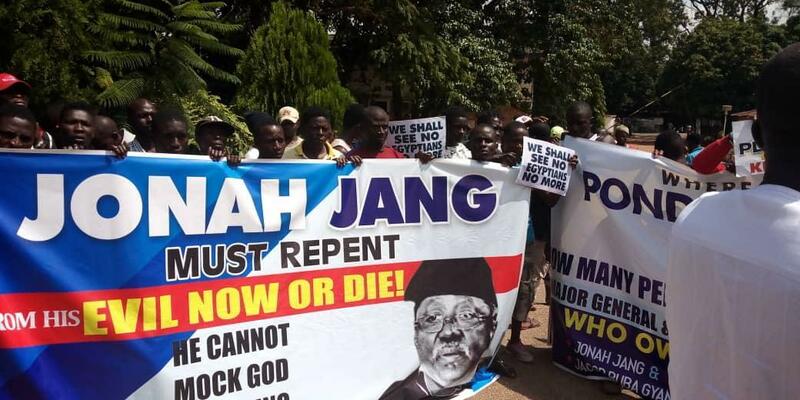 Rotdunna Sekat, while speaking on behalf of the group, called for the prosecution of the former state governor of the state, Jonah Jang, as one of the brains behind the bloodletting in the towm. “We were guided to Proverbs 29:2 that says “When the righteous are in authority, the people rejoice: but when the wicked beareth rule, the people mourn.” The people we identified in this authority are the Gbom Gwom Jos, Dr Jacob Gyan Buba and a former state governor, Senator Jonah Jang. They are the leadership whose hands drip with the blood of the innocent in our vision. “The acts of wickedness is not tolerable from any individual, when that individual happens to be a ruler it makes the situation doubly worse for citizens as their sins may be visited on the entire population. We have seen in 1 Samuel 2:31-33 that God takes authority away from the wicked and we have decided that God’s wrath must not fall on the people before we do the needful. “The Faithful therefore calls on the governor of Plateau state, His Excellency Simon Bako Lalong to immediately depose Dr Jacob Gyan Buba as the Gbom Gwom Jos, for his atrocities have reached to the high heavens where the killings of innocent people in the state is concerned. He has rather teamed up with Senator Jang to tolerate the killing of others by the Berom. “Dr Buba’s unholy alliance with Senator Jang is one that the state groans under. It is costing life and we hope that his removal will bring an end to the endless bloodletting. We also hope that he will use the period after his removal for introspection to so that he can properly seek forgiveness from our all forgiving Lord. Even as he seeks forgiveness from God, the Nigerian state should not neglect to identify the role he played in the killings in around that pond and take the measure that may be necessary. “As for Senator Jang, there have been enough entreaties for him to rescind his threat to make the state ungovernable since his party lost election. Unfortunately, all entreaties have fallen on deaf ears. HE has only intensified efforts at making militiamen out of his Berom brothers and the spirit of those fallen to the war he declared cry for justice daily. We have resolved to leave him to God to get his recompense.